Once you have created an epub file, publishing it through Kindle is relatively simple. 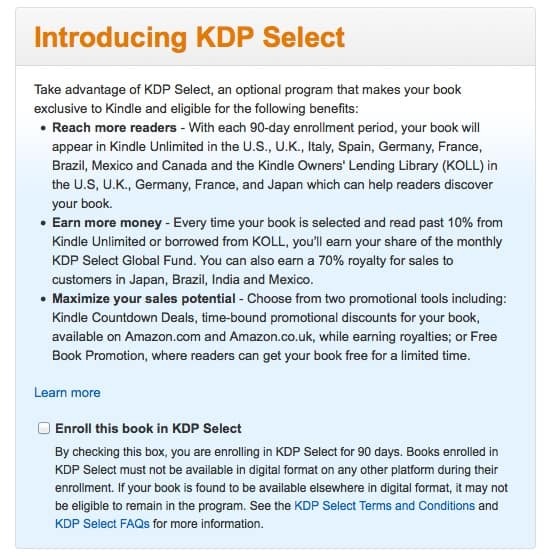 If you don't already have a KDP account with Amazon, you will need to create one. 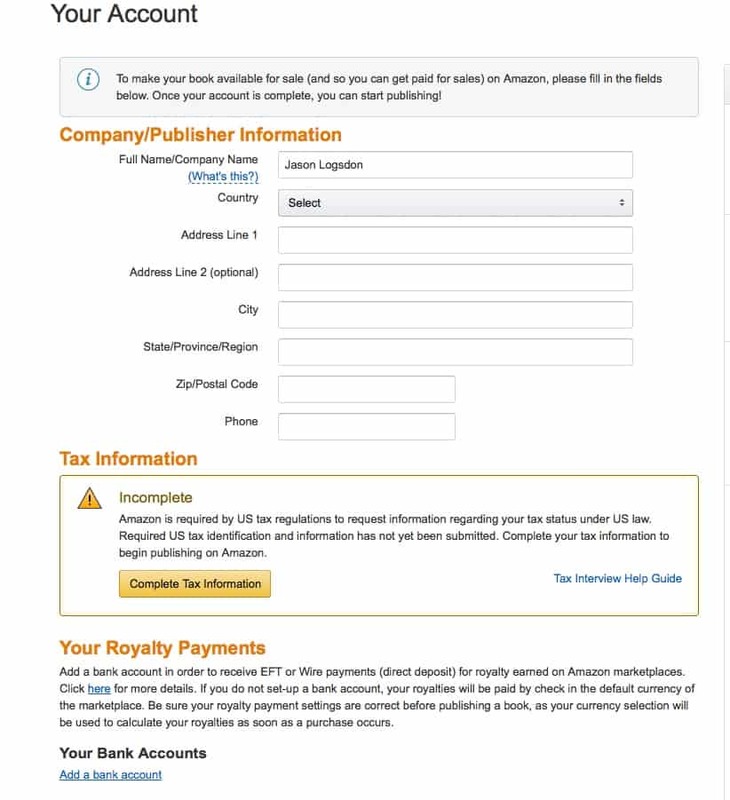 You can do that directly from Amazon's KDP site and it will be associated with your general Amazon account. As part of this process you will have to enter several different pieces of information. This includes the name, address, and phone number of your company or publisher name. Your tax information and tax indentification number. A bank account also needs to be added for direct deposits. Once you have a KDP account you can start to add your book as a "title". 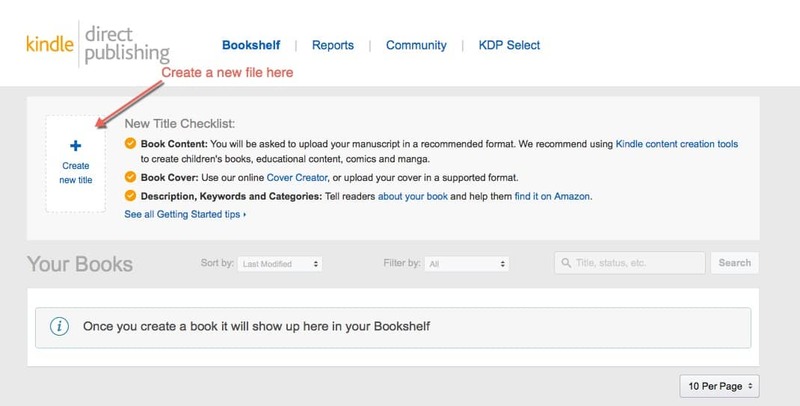 To add a new title, you will first click on the "Create New Title" button from your Bookshelf page. This will bring up step 1 of what we call the "Book Information" page. Step 1 requires several different pieces of information. After deciding whether or not to do KDP select you need to enter your book details. If your book is part of a series then you should add the series and edition number. The publisher is optional, but we recommend either using your name or the name of your blog. You will also need a compelling book description. On the Kindle you have very limited formatting options for your book description. You can also add any contributors that were an integral part of the book creation process. Only add people here if you want them to get credit on your Amazon Kindle sales page, right next to your name. This ISBN number must be different than one you have used for the print version. The ISBN number for a Kindle book is completely optional and isn't really used by Amazon any more. We recommend saving your money and not using one for most Kindle books. You can learn more about ISBN numbers. The publishing rights section just specifies whether this is a work of public domain or if you own the copyright to it. In most cases you will want to specify that it isn't part of the public domain, otherwise anyone can copy and use your work. 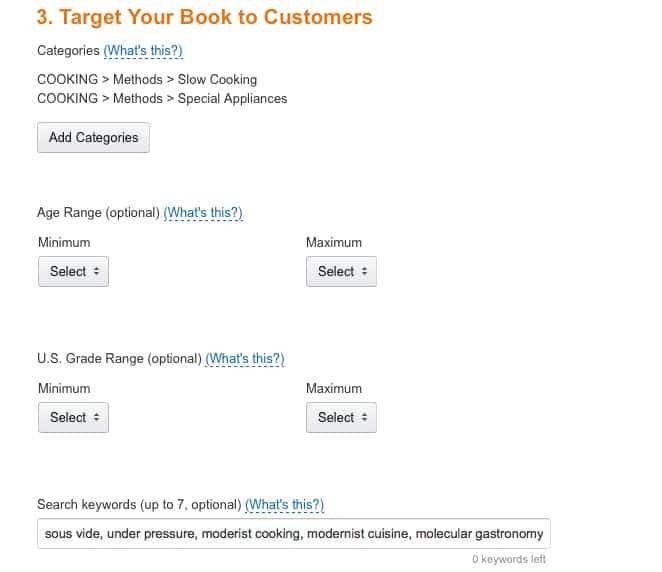 In the Target Your Book to Customers section you can help let Amazon know what type of people your cookbook should be marketed to. Picking your Kindle categories is an important part of the process. You want categories that are competitive but not too competitive. You can read more in our guide to picking Amazon categories. If your book is focused on a specific age range you can choose it here. You can only specify from a baby to 18 years old. It is usually left blank unless you are targeting your book at kids or teens. This specifies the suggested reading level for readers of your book. It only goes up to 12th grade and is usually left blank unless you are writing specifically for a younger audience. The search keywords is another important way to let users find you. They should be targeted to high traffic words that your potential readers would be using to try and reach your book. You can read more in our guide to choosing Amazon keywords. The book release allows you to delay the launch of your book or to release it right away. This allows you to easily time the release with any launches you may have planned. This is where you upload your cover. We recommend creating your cover in another program, but it is possible to create a nice looking cover using their "cover creator". Click on the "Browse" button and choose your Kindle-specific epub file. 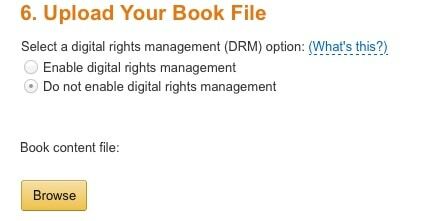 Whether or not you "Enable Digital Rights Management" is up to you. We write more in-depth about what DRM means. 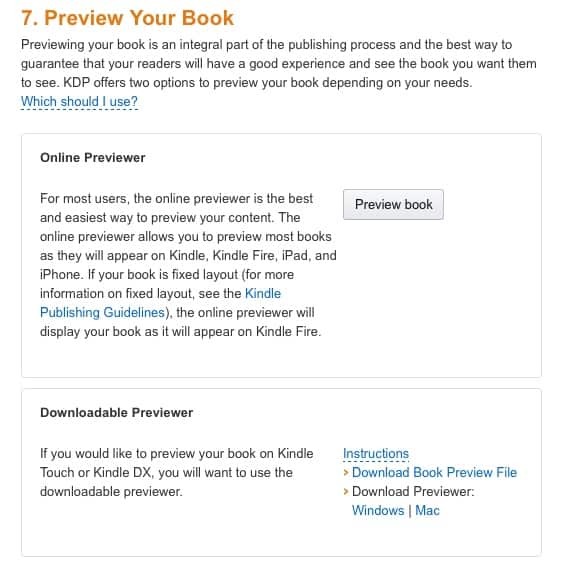 Once you've uploaded all the files for your book you can preview the book online or download any of the desktop Kindle preview programs. We highly recommend you do at least one final preview to make sure nothing got garbled during the upload process. 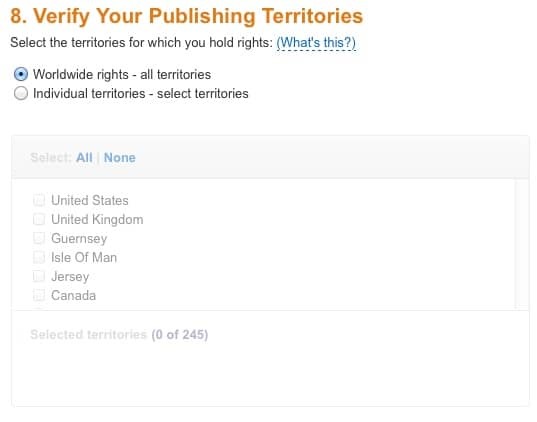 The second page of the Kindle book creation process has to deal with the rights and pricing across various countries. 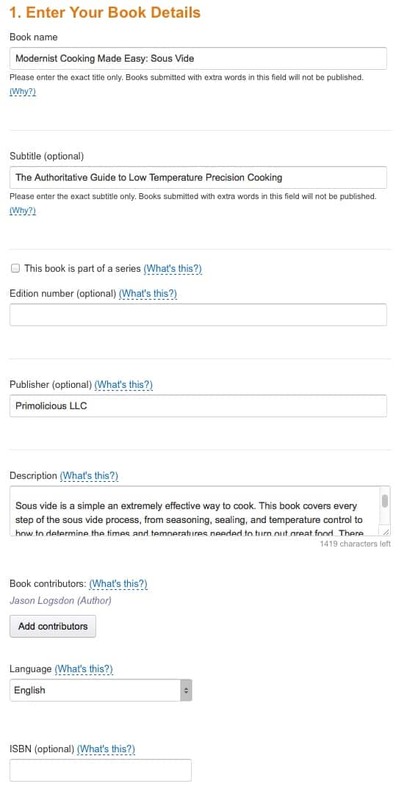 This option allows you to specify where you have rights to sell your book. You can either choose worldwide or select individual territories. If you are self publishing then you will want to choose worldwide. We talk more about pricing in our guide to how to price your cookbook. 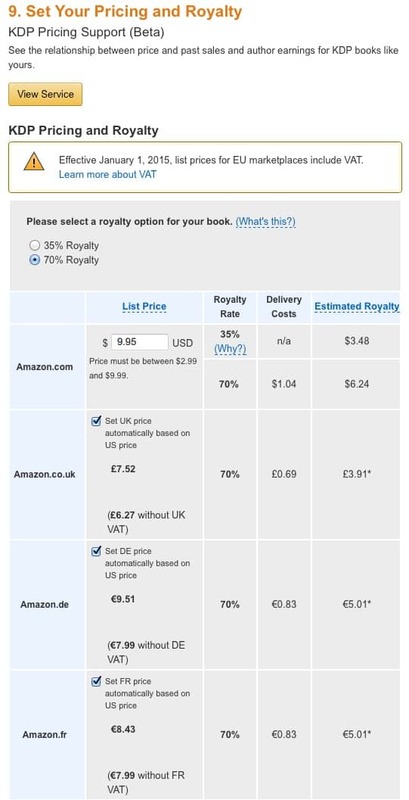 Once you've decided on your price, you need to select 35% or 70% royalty then fill in the US list price. The prices for the other territories will be automatically filled in, though you can overwrite it if needed. The Kindle Matchbook program allows you to offer a discount to people that purchase the print version of your book. This program is something we have tried to take advantage of as a service to our readers. Some people enjoy having a digital copy in addition to the print copy so we allow them to get the e-version for only $2.99. This allows your readers to lend your book to their friends and family after they have purchased it. We tend to allow this because we want to keep our readers happy, and hopefully the people they loan it to will want to purchase their own copy. Once you are happy with the information you have entered you are finally ready to publish your cookbook! Just hit the "Save and Publish" button and it will live on Amazon in a few days. If you aren't ready to pull the trigger yet, you can "Save as Draft" and then publish it later at your convenience.